Along with the launch of its integration tools, PayLeap is also introducing simplified pricing that offers an attractive lower rate for PaySecure® internet PIN debit transactions of 1.89% with $0.29 per transaction. 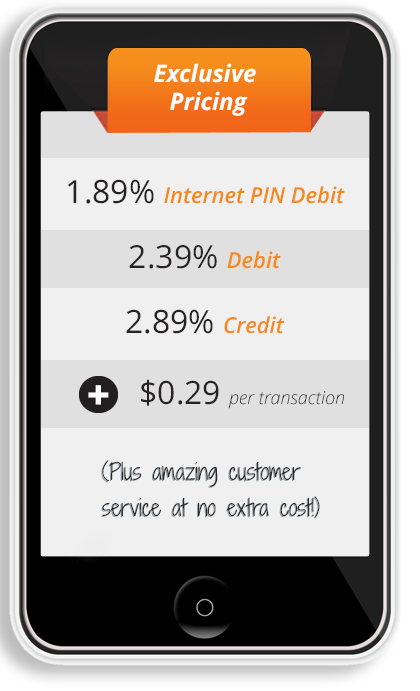 Debit transactions have a rate of 2.39% with $0.29 per transaction. All credit transactions are 2.89% with $0.29 per transaction. Merchants can significantly lower their payments acceptance cost by steering consumers to PIN debit for online purchases. The best part is that there’s no set up fee, and just a low cost of $19.99 per month that includes recurring billing, e-commerce, face to face, mobile payments and more!